The political power couple stood wide-eyed and open mouthed amid pyrotechnics as balloons fell from the ceiling of the Democrat convention. The Democratic presidential nominee pledged to foster an inclusive society, create jobs and make college tuition debt free for all. Hillary Clinton's daughter Chelsea has introduced her mother's formal acceptance of the Democratic presidential nomination with a pledge that as president, Mrs Clinton will fight against gun violence and climate change. Speaking on the final night of the Democratic National Convention, she said: "I'm here as a proud American, a proud Democrat, a proud mother, and tonight in particular, a very, very proud daughter." This November, I'm voting for the progressive who will protect our planet from climate and our communities from gun violence. Who will reform our criminal justice system and who knows that women's rights are human rights, and who knows LGBT rights are human rights - here at home and around the world. In a thinly-veiled swipe at Republican presidential hopeful Donald Trump, she added: "I loved that my parents expected me to have opinions and to be able to back them up with facts." More than 24 million Americans watched president Barack Obama's speech at the Democratic National Convention in Philadelphia last night. Our Washington correspondent Robert Moore said this is a win for the Democrats over TV-ratings chasing Republican candidate Donald Trump. Over 24 million Americans tuned in to Obama's passing of the baton last night. That's a win for Democrats & Trump cares about TV ratings. Hillary Clinton has tweeted that Barack Obama is "ready to pass the baton" of the leadership of the United States over to her. 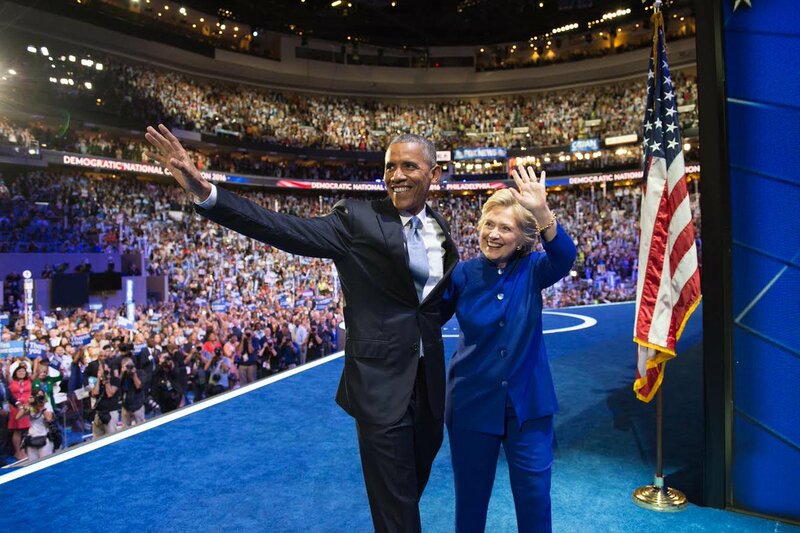 The Democratic nominee for president was given a rousing endorsement by the current president last night at the Democratic National Convention in Philadelphia. She tweeted this picture of the two of them waving to crowds. President Obama was at his best, as he used his oratorical skills to cajole Americans to back the "most qualified" Hillary Clinton. As Obama signed off with his last major speech in office, ITV News asked his supporters what a difference he has made in eight years.